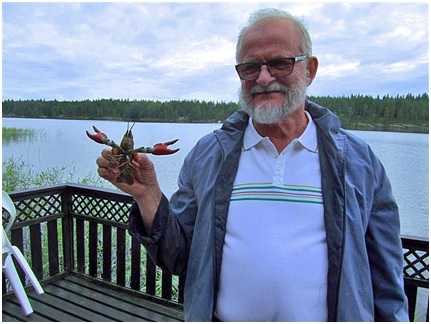 The 71-year-old language learning veteran Jaakko Kääriä is currently studying three languages at the same time: Russian, Italian and Spanish. In addition to practicing with WordDive, Kääriä attends language courses at the community college and hones his skills by chatting with international friends. – I meet up with a Russian friend twice a week. He teaches me Russian and I teach him Finnish. Back when we started our language learning sessions, we didn’t have a common language at all because he didn’t speak a word of English. I was surprised by how well we got along anyway. Now I have found another Russian friend who is also interested in Italian, and we plan to start learning it together. Jaakko Kääriä likes to write down all the words he learns with WordDive, so he keeps three notebooks on his desk – one for each language. *) With a tablet, it is easy to change to the Cyrillic keyboard and back. – At least in my case, I haven’t had any problems with studying several languages at the same time. My vocabulary is expanding quickly, but you can only learn to speak by speaking. You have to travel or get an international study buddy to practice the language with. This is how you put what you have learned to test in practice. Kääriä thinks it is rewarding to notice how you can actually cope in real life situations by using what you have learned. Even though Kääriä has always been interested in learning languages, until now his studies had progressed at a rather slow pace, and his results had been quite poor. Using English in the workplace had been a struggle. Learning with WordDive, however, has been a positive surprise. – When you are retired, you have time to sit in front of the screen. And I think that WordDive is a much more useful game than solitaire! I visit Russia quite often because we live next to the eastern border. It has been really nice to discover that I am actually able to speak Russian while I am there. For example, I can ask for advice and even understand the answer. Jaakko Kääriä’s most recent interest is Spanish. He has been intrigued by it for a long time, but only started studying it actively last summer. During his trips to the Canary Islands, he found out that contrary to what some people claim, you can’t really get by in Italian in a Spanish-speaking country. – I think Spanish vocabulary is quite different from Italian. Maybe that’s one of the reasons I don’t mix them up so easily. The grammar is similar, but that only makes the learning easier, doesn’t it? Kääriä points out. The best way to avoid mixing up the languages is to give them strong, clearly different identities. When you use the languages in different situations with different people, this happens naturally. However, if you don’t have the opportunity to practice the languages you are trying to learn in real life, you can try to associate them with different mental images through music. For example, if you study Swedish and Russian, choose a song in both languages and listen to it every time before starting to study that language. In this way, you can study two languages on the same day while having just a few minutes’ break in between. 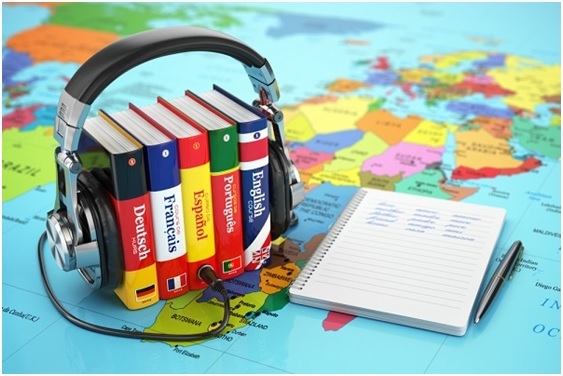 If you have comprehensive course packages in both languages, you can start with a course of the same topic in both languages at the same time. This approach takes advantage of a cognitive scheme called priming, which means that whatever you have observed and thought about before will affect what you will think about later. For example, if you learn the word “carrot” in English and then learn the same word in Spanish, you’ll find that you already have carrots on your mind, so it will be easier to memorize the Spanish word as well. Find ways to incorporate both languages into your daily routines. There are only so many hours in a day and they can’t all be used for studying, so use your imagination and try to make your everyday life as multilingual as possible. For example, if you are studying German, change the language of your phone to German. If your second language is French, put some French music in the CD player in your car. You can also write your shopping lists in German or get a French cookbook. If possible, set the subtitles of the movies and series you are watching to German or French. 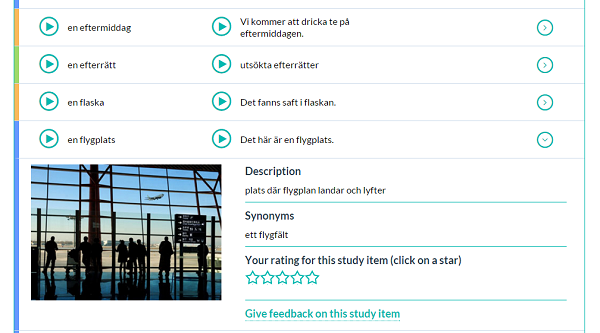 *) Have you noticed that you can review the study items you have exercised on the Vocabulary page without having to write them down? The color code on the left side of each study item tells you whether the item is Permanently learned (blue), Exercised (green) or Started (yellow). You can listen to the answers and example sentences by clicking the little play buttons. If you want to see the translations, just move the mouse over the study item or the example sentence.